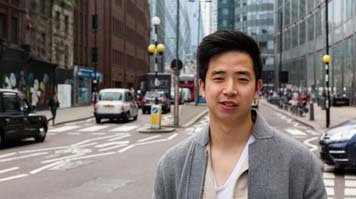 Michael Le, who is a marketing manager at Amazon Music, graduated from LSBU with a BA Business Administration and an MSc International Marketing. Here he shares his career journey, and advice he’d give to the next generation of LSBU students. "I decided to study MSc International Marketing for two reasons: I underachieved on my BA Business Administration and I wanted to set the bar high for the next generation. After all, my parents didn’t go to school, so they didn’t receive any formal education, but I wasn’t going to let that have a negative impact on my future. "During my studies, one of my lecturers, Mel Godfrey, was a fantastic mentor who really inspired me. I had a troubled past and Mel always had time for me, made no judgments and fully supported me, especially with my dissertation. "I spent most of my time at university as I didn’t have a PC at home, so I spent a lot of time in the Learning Resource Centre (LRC) and library, it was pretty much my second home. I was fortunate to not have any other commitments other than my studies. My first year out of LSBU was probably the most daunting time of my life. "I didn’t have any relevant experience so I kept seeing sales roles masked as marketing roles. Don’t fall for the trap! My first job was a business door-to-door role and I was intimidated by the business owners to the point where I quit on my fourth day. I then found a telesales job and after two months, I’d made no sales. If you’re thinking I’m totally rubbish at sales, you’re right – I was so bad. I was then fired and then rehired as a Marketing Executive and it was all down to the sales director who had faith in me. It’s definitely helpful to surround yourself with those who will lift you back up, even when you don’t believe in yourself. "I used to be a super shy person and never really got involved with discussions in both university and work. "Truth is, you can never really be heard if you’re shy. The change came when I went to Vietnam in February 2013 to volunteer at an orphanage for two weeks to help underprivileged children. On my first day at the orphanage, I realised being shy won’t allow me to change the lives of orphans here. So I took matters into my own hands, created my own charity called Fundraise For Vietnam and completed numerous fundraising challenges and charity projects. I now understand how to make an impact in the world, you can’t just stand back and watch the world go by. "Every year I come back to LSBU and attend the Marketing Careers Evening where I spend a lot of time with the undergrads to help prepare them for leaving LSBU and entering the job market. For them, it’s a great eye-opener as some believe a job will just be waiting for them once they graduate. This is far from the truth! "One important piece of career advice I will give is to make sure you are continuously learning. "The moment you stop; you have either outgrown the role or become complacent. A career isn’t meant to be easy and the satisfaction comes from overcoming difficult tasks or projects. "One of my key motivations is my three-year daughter, she isn’t just someone who keeps me motivated, she is my “why”. Being your own motivator is not enough because there will be days where you will get knocked down and will struggle to get back up. Every morning when I wake up, I can see my “why” and for that reason, I’m focused on my goals. "My best advice to LSBU students is to never be complacent in life and to keep pushing past your perceived limitations. "There are no hand-outs so make your own opportunities when the world doesn’t believe in you. No matter what life throws at you, keep moving forward and don’t let failure determine your outcome. To unlock your potential, you need to be obsessed with your craft and stay away from negative people – they will only slow down your success. In order to succeed, you must take a leap of faith. Those who stand still will never unlock their potential. Feel free to add me on Instagram and LinkedIn. I’m more active on my Instagram account so expect to see my motivational Monday talk, updates on Fundraise For Vietnam activities and my three-year old daughter! ".